The Emerald Guide to Baseball, edited by Gary Gillette and Pete Palmer with Rod Nelson and Ted Turocy, is the most comprehensive record of the previous baseball season. Historically, the primary purpose of annual baseball guides has been the publication of the official league standings plus the official team and individual statistics for both Major League Baseball and Minor League Baseball. Our new Emerald Guide follows faithfully in that tradition, containing the official batting, pitching, and fielding statistics for every team and every player in the Major Leagues plus extensive lists of league leaders. The Emerald Guide to Baseball is our attempt to fill the gap in the historical record created by the recent demise of The Sporting News Baseball Guide. First published in 1942, The Sporting News Guide was truly the annual book of record for our National Pastime. It is our great privilege to document for posterity a slice of recent baseball history in our new book. 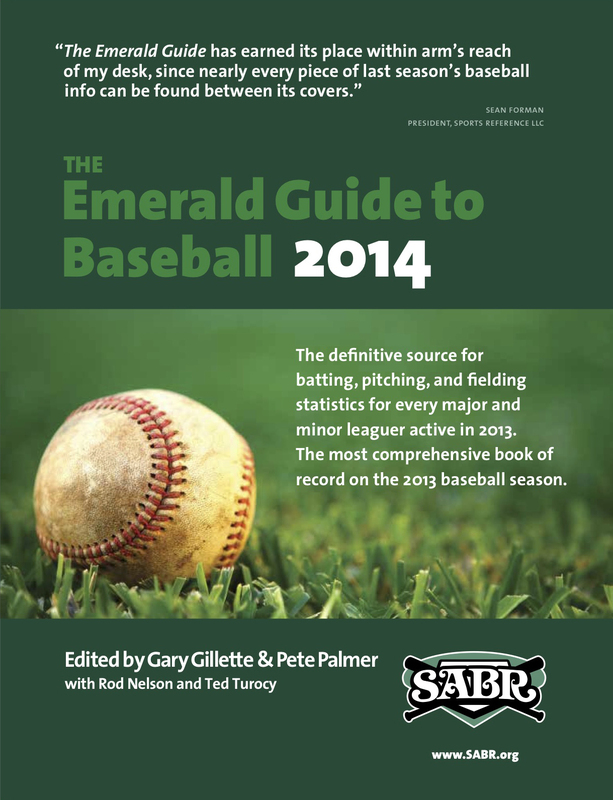 The 2014 edition of the Emerald Guide runs more than 600 pages and covers the 2013 season; it also includes a 2014 Major League Season Preview with Franchise Directories, Schedules, Spring Training Rosters, Minor League Affiliates, Broadcasting Information, and Career Leaders in 26 Categories for All Major League Teams. The Emerald Guide is available in both a printed version and in a downloadable PDF format. The printed version will be available after Opening Day of the 2014 season. To learn more about other SABR research resources, visit SABR.org/research. This page was last updated June 6, 2016 at 12:12 pm MST.